Fantômas are one of Mike Patton's many strange projects. They are very, very odd. If Herbie Hancock chews on your brain, these guys take a run at it, tear off a chunk and throw it into the air before laughing maniacally. I can't recommend them as an easy listen, but they're an interesting look at the boundaries of musical experimentation. Live, the increased volume and the spectacle of Patton caterwauling and throwing himself about turn the experience into what I can only call a bemusing headfuck. 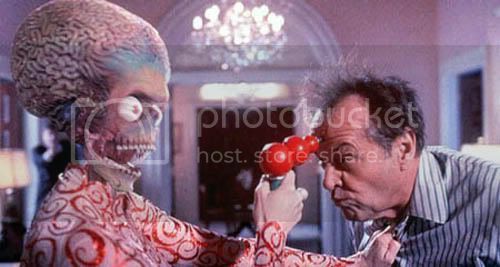 You remember those aliens from Mars Attacks? This is what they have on their iPods.